Technology has taken a new turn lately with the introduction of the GuruPlug Server to the computer market. This innovative and tiny device combines all the features you’re used to with low power pcs, with one major exception: it is the size of a human palm and plugs directly into the wall socket. It is extremely energy-efficient, using only 5 watts of power to run a 1.2GHz processor, with 512MB of RAM, Wifi and Bluetooth. This makes it ideal for tasks that require the computer to be always on, but require a range of connectivity options, such as for home automation projects. The GuruPlug Server’s low power consumption is possible due to a range of energy saving electronics, as well as a modest 1.2 gigahertz microprocessor. The server is ideal for remote monitoring stations, home automation, long-term surveillance and VoIP. Essentially the GuruPlug server is ideally used where having a low powered and low cost computer at a location remote to larger servers is desirable. The other technical specifications include: 2x USB 2.0 port and 2 gigabit Ethernet ports. 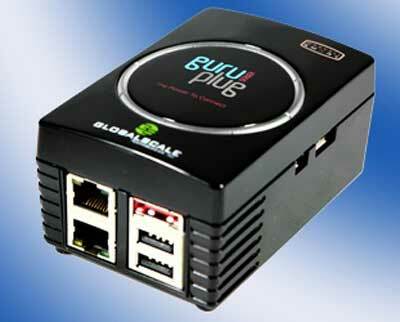 For the GuruPlug Plus model, you also get 1x External MicroSD Socket and 1x eSATA 2.0 port. For the low-level developers, the GuruPlug server features a Mini-USB Port and a JTAG Port for debugging and programming. The server can host operating systems like Ubuntu with ease, meaning you don’t need to learn any exotic Linux platforms. The physical dimensions are only 95mm (L) x 65mm (W) x 48.5 mm (H). The GuruPlug Server is available in both the UK and Europe for £89 plus delivery. that’s a beauty of a server. It’s really tiny and cheap as well. The specs aren’t too great though. Don’t be fooled by the gbit network interface. With such a low spec processor there’s no way you’ll be making use of this transfer speed. Gbit is just the default offered on all networks. Otherwise It looks like a fantastic product for very simple home automation projects. I’d like to see how this compares in terms of performance against the fit2pc which uses 9watts. Actually, some systems only offer 100Mbit interfaces… either way, this particular system is not exactly designed for high bandwidth applications. I would imagine that at least the processor has enough grunt to throw about 1Gbps of data about considering a 486 had the capability with room to spare and ran at 133mhz at best, the question might be if the bus to the network interface is fast enough and where your getting the data your throwing at it from.